Ok, i looked around and didnt see this anywhere. Hey! DC7 isn't working on my PSP!! What's going on??? You might have different problems. For example, you might have done something wrong while making the DC7 pack (ms or battery), you might have a 0% of battery charge, you might be using AC cable and it goes directly to VSH instead of the DC7 menu... check those usual problems first. Also, it might be that your MS is a fake one, so check it also. Well.. ok, already checked that, but it's nothing of that and i believe that i've made properly the DC7 pack. Then we should ask us other stuff. What original firmware was your PSP firmware packed with? Errr.. where should i look that? Uhh.. well, i dunno, i think it came up with 4.01 or 4.05. Well, then you might have a TA-088v3 mobo, if thats for real. And whats the deal with it? Well, hold on a second, i've not yet bought it! What should i look for? It looks like the 2000 series PSP (Slim) that have the letter "G" or superior on the boxcode are the ones that have this mobo. Ok then, but how should i know if mine is one of those being 100% sure? - Connect your PSP via USB. - Format it using the command "mspformat E", being "E" the letter of your PSP on your PC. - Program will ask you to confirm it, press Y. - Plug out your PSP. IMPORTANT: DO NOT format again the MS within the PSP until this test has finished. - Connect again the PSP via USB, and manually create PSP and PSP/GAME folders. Next step must be done on a PSP homebrew capable (with CFW). If you don't have it, ask someone else to do this step and give you the resultant files. - Copy the GETIPL folder to PSP/GAME. Get the 3.90 and 4.05 updates, and put them onto the MS root with the following names: "390.PBP", "405.PBP". - Run the GETIPL app from your PSP homebrew capable, and it will create a couple of files on the MS root, called "ipl390.bin", "ipl405.bin". - Connect the PSP via USB, and use the "msinst" program that its included on the pack to install the 3.90 IPL on the MS.
- You must do it this way: "msinst E E:\ipl390.bin", being "E" your PSP letter on your PC. Program will ask you to confirm it, press Y. - PSP turns off inmediatly after starting - Your PSP is NOT a 88v3. - PSP keeps turned on with a green light forever - Your PSP is a 88v3, or you have done something wrong. Next step will confirm it. - Connect again the PSP via USB, and use again the msinst, but this time with the 405IPL. Remember, "msinst E E:\ipl405.bin", being E your PSP letter on your PC. - PSP turns off inmediatly. If PSP turns off inmediatly with this IPL and on the other test it had that green light forever, it will be 100% sure a 88v3. - PSP keeps with a green light forever. This CANT be on any PSP, being 88v3 or not. If this is the case, youve done something wrong. So, once you have done all this, youll know 100% sure if its an 88v3 or not. Last edited by _L33t N00b Sn1p3r_; 01-10-2009 at 02:12 PM. Last edited by Aaron*1; 01-24-2009 at 02:06 PM. 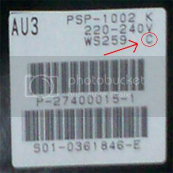 if i have the letter g in the boxcode then my psp is unhackable? Before making a pandora battery, should it be 100% loaded 100%? During the entire process - including the making of the Pandora battery, should the power AC be pluged? if the batteries charged 100%, there's a less chance that you won't break it. it doesn't have to be fully charged, and the chances of you messing it up are like 1 to over 9000.
also while your making the battery, it doesn't have to be fully charged, but you don't want the battery to die right when you make it into pandora; it might explode lmfao. jk. Mine said "J" on the box, does that mean i have the unhackable motherboard? Most likely to have the unhackable motherboard...What FW did it come with out of the box? Yes your mobo is unhackable, any letter after G is unhackable. BUT you can use chickHEN r2 and get the GEN cfw for HEN so you have cfw, so all are hackable, but with chickHEN it doesnt say on once you turn off your PSP, it will stay on standby however and this is what I tell people to do because it takes a long time to boot the PSP into the chickHEN environment.